Your winners of the 2017 Pro Anglet. 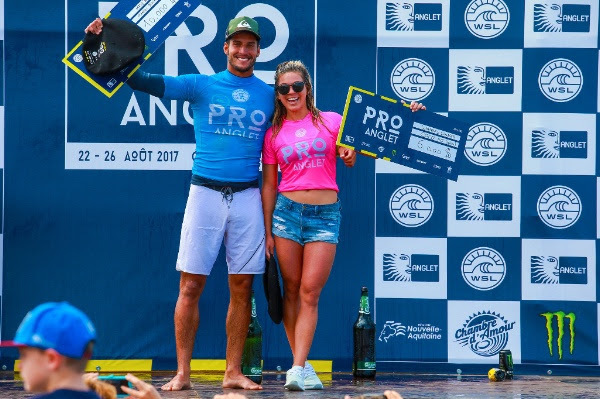 LA CHAMBRE D’AMOUR, Anglet – France (Friday, August 25, 2017) – Coco Ho (HAW), 26, and Ramzi Boukhiam (MAR), 23, have claimed the QS1,500 Pro Anglet titles today in two-foot waves. Their victories punctuated an exciting finals day that started with the semifinals in better conditions earlier this morning.Ho and Volcom teammate Maud Le Car (FRA), 25, battled in a shifting lineup for their final, as waves become rarer on the outgoing tide. While both surfers gave a great show to the large crowds watching from the beach and promenade, it was Ho that scored the highest with dynamic surfing on the little lefts on offer. Coming from her best result on the Championship Tour this season, an excellent third place in Huntington beach, the Hawaiian kept her winning form going and claimed her first event win of 2017. Le Car finally put an end to a string of bad results that have ruined her qualifying efforts in 2017. The talented French surfer built momentum through the rounds in Anglet but unfortunately couldn’t quite match Ho’s rhythm in the final. Her runner-up finish is a season-best and a great sign heading into the all important Galician event of Pantin. Le Car had previously dispatched of Pauline Ado (FRA), 26, in a great semifinal matchup. In the men’s final, Ramzi Boukhiam faced Jorgann Couzinet (FRA), 23, and clashed in the same complicated conditions. Both surfers posted an 8+ ride early on but only the Moroccan managed to find a second big score, to win his first event in five years. Boukhiam is having a solid season with two big results previous to winning the Pro Anglet, and is a serious candidate for the QS Top 10 at the end of the season. Currently ranked 29th, the talented goofy foot will try to carry his momentum into the next two QS6,000 in Europe. Couzinet was once again refused his first-ever QS win, reaching the final for the third time this season. But the Reunion Island surfer remains the strongest European competing in 2017, currently ranked 17e on the Qualifying Series. After five disappointing results, it seems he’s finally got his act together again and will be a legitimate threat heading into the next few events. The Pro Anglet is scheduled from August 22-26, 2017 at La Chambre d’Amour, Anglet – France. 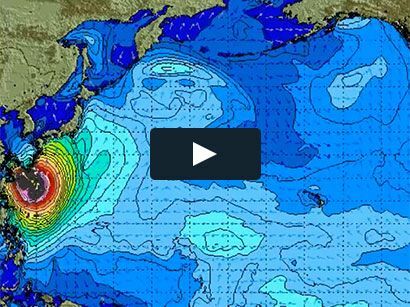 For all results, photos, video highlights and press releases, log on to worldsurfleague.com. 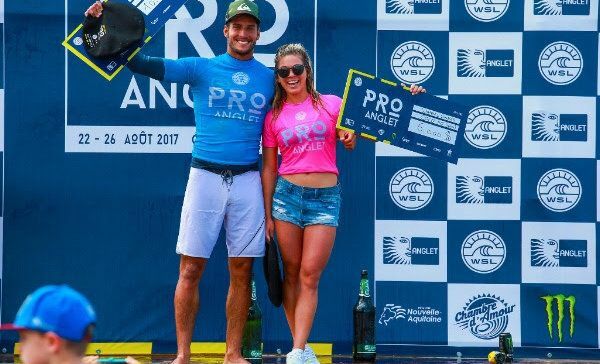 The Pro Anglet is supported by the city of Anglet, the Région Nouvelle Aquitaine, Carlsberg, Monster Energy, Magicseaweed, L’Équipe and Virgin Radio among others.